Later mythologies have somewhat eradicated the role Sir Parzival (Perceval/Percival) plays in the Arthurian legends. A knight of great courage and ability, it is he who first becomes involved with the Grail rather than Sir Galahad. He first appears in Chrétien de Troyes' unfinished Perceval or Conte del Graal (c.1190) as well as the Welsh Romance associated with The Mabinogion, Peredur Son of Evrawc, which dates from the 13th century. Both interpretations are likely to be based around the much earlier Celtic story of Peredur. De Troyes' story was also the inspiration for one of the greatest romances of the Middle Ages, Wolfram von Eschenbach's Parzival (c. 1200-1210). As in the earlier version, his Parzival is initially naive and foolish, having been sheltered from the dangers of the chivalric world by his mother. Having seen her husband and two sons killed in battle, she was committed to keeping her youngest ignorant of all things relating to chivalry and knighthood. This leads to him making an idiot of himself when he comes across a party of knights and believes them to be angels. In both versions Percival is the guest of the wounded Fisher King (called Anfortas by Eschenbach but unnamed by de Troyes) at whose castle he sees a wondrous procession in which youths carry magnificent objects from one chamber to another, passing before him at each course of the meal. First comes a young man carrying a bleeding lance, then two boys carrying candelabras. Finally, a beautiful young girl emerges bearing an elaborately decorated graal, or grail, who ends the procession. Percvial fails to ask his host what is going on (because he has been taught it's impolite to ask too many questions). Throughout de Troyes refers to his object not as The Grail but as un graal, showing the word was used, in its earliest literary context, as a common noun. For him the grail was a wide, somewhat deep dish or bowl, interesting because it contained not a pike, salmon or lamprey, as the audience may have expected for such a container, but a single Mass wafer which provided sustenance for the Fisher King’s crippled father. In Eschenbach's tale Percival's failure to ask about what he is seeing is a significant one because, had he done so, then the Fisher King would have been cured. When he awakes the castle is empty and he has to flee to escape it. Upon learning of his mistake he vows to find the Grail castle again and fulfill his quest but de Troyes' story breaks off soon after and it then follows a variety of pathways depending on the author throughout the remaining mythologies. It should also be pointed out that, in these Grail stories, the vessel itself has nothing to do with Christianity and is firmly rooted in Celtic mythology. There are direct comparisons between the Fisher King and the Irish mythology of Bran the Blessed. Bran had a cauldron which could be used to restore the dead, although they were unable to speak once ressurrected. He gave to the king of Ireland as a wedding gift when he married Bran's sister Branwen. During a war with the Irish later in the tale, Bran is wounded in the foot or the leg and the cauldron is destroyed. Bran asks his companions to sever his head and take it back to Briton to be buried. While on their journey the head continues to speak and interact with the knights. They land on the island of Gwales (which has been identified as possibly Grassholm Island off Dyfed), and spend the next 80 years in a castle full of joy and abundance. However, they finally leave and bury Bran's head in London. There are also similarities in two other Welsh texts of the same time period, The Mabinogion tale of Culhwch and Olwen, in which King Arthur and his men travel to Ireland to retrieve a magic cauldron, and the poem The Spoils of Annwn, which also describes Arthur's search for a mystical cauldron in the otherworld. In the Welsh epic Peredur son of Efrawg, again loosely based on de Troyes (of from a common original Celtic tale) there is no Grail however the character of the Fisher King does appear, although he isn't named as such, and presents Peredur with a severed head on a platter. Peredur later learns he was related to that king, and that the severed head was that of his cousin, whose death he must avenge. Other Medieval texts to feature Percival include the Didot-Percivale and Perlesvaus (also called The High Book of the Grail or Le Haut Livre du Graal). It is in Robert du Boron's Joseph d’Arimathie where the Grail first becomes associated with Christianity. It tells how Joseph acquires the chalice of the Last Supper and uses it to collect Christ's blood when he is removed from the Cross. After Joseph is thrown in prison, Christ visits him and explains the mysteries of the blessed cup. Upon his release he gathers his in-laws and other followers and travels to the west (usually associated with Glastonbury), and founds a dynasty of Grail keepers that eventually includes Percival. 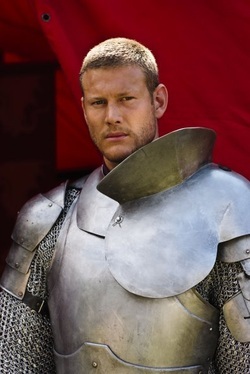 However, by the time we get to Sir Thomas Malory and his Le Morte d'Arthur, written in the 15th century, Percival's role has become that of a supporter to Sir Galahad, along with Sir Bors, on the search for the Holy Grail. The most common association with any historical figure for Sir Percival are references to Gwrgi and Peredur, twin sons of Eliffer, members of the Coel Hen dynasty which frequently appears throughout the early Welsh Arthurian myths. The connection makes them first cousins of Urien Rheged, who himself appears within Athurian mythology. A great deal of discussion between scholars and historicans has focused on the relation of Peredur to either the sixth-century Peredur son of Eliffer as well as de Troyes' Grail hero Perceval. The Peredur of Welsh romance differs from the Coeling chieftain if only in that his father is here called Efrawg rather than Eliffer and there is no sign of a brother called Gwrgi. Efrawg however, is not a name, but the historical Welsh identity of the city of York (Caer-Ebranc, also known as Eburacum by the Romans and in modern Welsh as Caerefrog ). The brothers are said to have founded the town of Pickering in North Yorkshire, which would seem tie in with a historical connection to the same part of Britain as they were said to have jointly ruled over Ebranc. They are best known for taking part in the Battle of Arfderyd, fought, according to the Annales Cambriae in 573, during which King Gwenddoleu is defeated and his bard, Myrddin Wyllt, (identified as one of the sources for Merlin), goes mad.